On reconstructing a quiet, magnificent life for an extraordinary artist. 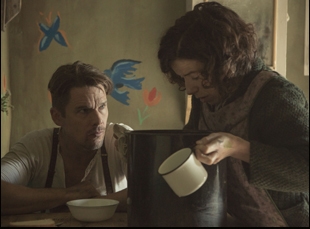 Throughout the production of “Maudie,” production designer John Hand and his team would sneak into the house they had built for the film’s two lead characters Maud and Everett Lewis (Sally Hawkins and Ethan Hawke) to touch up the paint while the rest of the crew was either asleep or working in other locations. At a nearby gymnasium outside of their location in St. John, Newfoundland, they had prepared four different sets of walls for the three decades the film covers spanning the marriage of the couple, a bond forged at first for convenience by a surly fisherman and a woman afflicted with severe rheumatoid arthritis whose hobby of painting grew into a professional calling, and to reflect Maude’s use of the humble 12’ by 12’ abode as her canvas, as time went on, so did more coats of acryllic. Inspired by the world around her in the rural countryside, flowers would blossom on these walls and farm animals would run rampant. In other words, the production wasn’t just building some house. They were building a life. The Lewises’ real house now resides in the Art Gallery of Halifax to be appreciated as any other work of art would be, but thanks to Aisling Walsh’s exquisite and thoroughly absorbing portrait of the couple, one feels as if they can spend time inside of it to witness it become a home. At first, there’s a question as to which is more chilly – the cool, crisp Northeastern air in the couple’s neck of Canada or Everett’s initial reception of Maude, who takes notice of his flyer at the general store seeking a housemaid. However, bonded in their unique perspective on the world — and unique from each other — they find ways to disarm one another, particularly as Maude is able to express her vision in rich, observational portraiture that starts making more money for the couple than Everett’s business of fish and chopped wood. While the two led a quiet existence, the film speaks volumes about their relationship, with Hawkins and Hawke inhabiting the pair as much as the production went into minute detail to replicate the refuge they created for themselves. 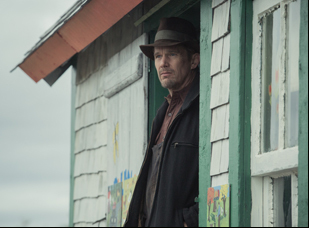 Coming off well-received premieres in Toronto and Venice last fall, “Maudie” arrives Stateside this week and while in Los Angeles, Walsh reflected on bringing the couple’s hard-earned romance to the screen, how authenticity shaped the production and how she was drawn to Sherry White’s magnificent screenplay. At Toronto, you had mentioned that you were keeping an eye out for projects that centered around a female artist. Where did your appetite to tell that particular story come from? I’m just really moved by those stories of artists and the struggle that they have to create their work, particularly women artists. I’ve got friends who are painters, because I started as a painter, so I know something of that struggle and sometimes projects come along and you just think they’re so right for you at the time they arrive. There are two things I loved about the film – one, [Maud] as an artist and her story, and two, the portrait of that relationship and that marriage, which is quite unusual. That’s what made sense to me. Sometimes when you read a script, you’ve got to see yourself out there doing it and I saw that when I read the script. You also mentioned this had been in ‎development for nearly a decade before you came in. How much was it there and how much did you get to make it your own? A lot of it was there. The script that I read was beautiful. Very moving and very touching. Then we had to find out a way to do it, and people to do it with. When you’re doing something as a director and it’s a project that you haven’t written, I need to make sure I understand what Sherry [White]’s trying to say or what a scene is about. A lot of conversations that we had would have been about that, just to get a sense of what she has in her mind. Then you’ve got a true story, so I always do my own research that’s me alone – things I feel I need to know about maybe the time or the people. I didn’t know that part of the world, and the first thing I wanted to do is to see the house, because that was going to inform so many things for me. Then you discover little things along the way. The aprons that she wore, the clothes… she had a little brooch that was a painting palette with brushes that in her later life that Maude wore quite a bit, so I thought, I’d love to have that kind of detail – that’s what I bring. The producers had been developing this for a long time, so they knew the story. There were various drafts, and you sometimes go back. I read the very first draft that Sherry wrote, to see if there’s anything there that was now valuable to put back in. But it was there from the very beginning. You saw those people and who they were. She knows that world. That humor and beauty and that sense of color and light, she had written it in the script. It only recently dawned on me that you must have shot this in order because of the way that the house changes. What did that give the film? The thing that gave the film more than anything else was building that house out on the landscape and deciding that we would build it, the original [size] 12′ by 12′. We built it a bit larger. I think it was 13.5′ by 13’. B‎ecause Ethan was too tall for the original measurements, right? T‎he ceiling was very low. You could have built that house in a studio. We talked about that. But that changed the film for me. A lot of the work I’ve done, I’ve done on location. I just relate to it in a really good way and I knew it would give the actors great freedom. If Ethan felt in a scene he wanted to walk out the door and stand across the road and yell back at [Sally], he could do that or go out and bring his dogs in. She could do the same. All of that stuff that you couldn’t do in a studio, and we were going to have to build the house anyway. Does the weather factor in? In Newfoundland, they get quite tough conditions. The reason that we were talking about it in the studio was because we were afraid of this weather. But we had very strong design and we housed the crew in – you see it occasionally in the film – these sheds at the back of the house. We dropped two metal containers that you see on ships and built his sheds around that, so people [could keep] warm, and go off and have their coffee, or if Sally needed to change quickly, she could do it and so on. That changed the film. Then we did have to shoot in order, obviously, because those walls had to come in and come out. Not for filming – we decided we wouldn’t move the walls [because it] would take two hours out of your day to move a wall, and you’re dealing with the elements coming in as well, so we divided [filming] into decades, really – the ’30s, the ’50s, the ’60s and [for instance] you get to the end of the ’30s [shoot where Maudie’s] painted a little bit, like the chicken on the wall, and it was done overnight – the flowers and stuff. Then we’d move on to the very vivid face, or we went off and maybe filmed in the orphanage or in the town or at Aunt Ida’s, whatever it was. Then went back [after the painting was done]. When it came to Sally and Ethan’s performances, what did you work on? Sally had a little bit longer to work, because she was attached to the project for longer. One of the first things I did was showed her that documentary [for the CBC which is excerpted for footage in the film]. Then I got her painting lessons. We found somebody in London that was of that naive artist style and they’d meet up once a week and paint in a little church hall in the center of London. Sally and Ethan can probably explain it better than me, but sometimes with real people, you know, what you’re trying to do is find an essence, an honesty, a truthfulness and a respect for who those people were. You get a hint of it in the documentary. You hear them speaking, you see them moving and that was very helpful for them both. Then Ethan has a home in Nova Scotia. He spent the last 15 years going on various holidays and visits there, so he felt he really knew those fishermen and those people. You look at him in the film, and you think, “Actually, yeah, here is a guy who’s worked really hard for 30 years that can’t read or write, that was an orphan, and that has nobody in the world – quite a solitary individual.” And Ethan really understood that isolation and what it is to be silent and lose yourself. It’s a real challenge, because you’re not holding on to acres of dialogue and endless speeches. You’ve got like two words to say in three scenes and that was the challenge for Ethan – a character that’s very different physically, and much slower, quieter a man than Ethan is in life. So you’ve just got to lose yourself and find something within yourself to get you there with all the help that we can give him. The house made it so real for both of them. Let’s say Ethan says, “Oh, I’d love to have opened up the door in this scene,” but he can’t because we’re looking at a black hole outside [in a studio] Then it becomes a huge number for [the director of photography] to light it, and [this film] really needed natural light, [that] simplicity to it. I know s‎implicity is not equal to ease, but is this a situation where you find yourself stripping away as opposed to building? The simplicity of something is always where I come from in my work. Yeah‎, you’re building in one way. [Everett and Maude] are quite far apart at the beginning – it’s two people sitting in a room together that’s rather uncomfortable, then it becomes much warmer‎ and their relationship becomes more interesting. But then you’re taking away in another way. Not that I am or have ever wanted to be one, but I often think “If I was in this scene as an actor, what’s the important thing for me? My costume needs to feel like my own clothes…” all of that stuff, and then you just strip away. Writers sometimes come from a place of writing a lot of dialogue and I come from a place of actually looking at a picture and thinking, “What does he need to say to her? Does she need to respond?” It’s rather simple, but actually quite complex when you pull it apart. It looks very simple, “Oh, this house on the side of the road.” But to actually achieve that, all of that work had to be replicated. [There were] 70 paintings made [with] each era worked out, what she would have been painting. We were in a slightly different landscape [making the film] than her world really was. How do we fit those pictures into our landscape? Then [we had to establish] time passing and seasons passing. A sense of place and time is always really important for me in a film. After I read a script, one of the first things I do is to create a date for myself [where] I can see the beginning, the middle, and the end of what that is —I break it down for myself, so I can understand it. It’s 1938 in the beginning and we’re in 1970 at the end, and then you bring in those elements from the outside world. People used to drive past the house — It’s not that far outside St. John’s, but it’s one of these rural places that people go hiking and skiing — and they’d stop and go, “Good God, I never knew there was a house here.” Day and night. Days passing. That’s what their lives were. Everyday probably seemed like hours. They get up and they’d stoke up that fire. That, for them, is survival. 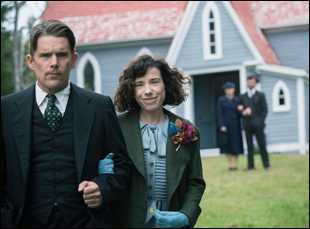 “Maudie” opens on June 16th in New York at the Lincoln Plaza Cinemas and the Angelika and Los Angeles at the Landmark and the Arclight Hollywood. L.A. Film Fest '17 Interview: Billy McMillin on Leaving It All on the Field for "The Classic"
L.A. Film Fest '17 Interview: Sara Lamm on the Birth of "Thank You for Coming"